I’m a crazy cookbook collector. I have shelves upon shelves of cookbooks, so many that I can’t even find a place for them all in my kitchen. There’s a cabinet in the dining room that holds a healthy stack, while the rest line the shelf in my study that’s slowly bowing in the middle as it attempts to hold their weight. Because while the internet is an abundance and wealth of information, there’s something just really freaking nice about holding a book in your hands. I mean, the first thing I do after I unwrap a new cookbook is flip through the pages and mark (I know, I know, purists will gasp but I’m a shameless dogear-er all the way) the photos that inspire me and the recipes that I want to try. You don’t really get that same satisfaction with bookmarking in your browser or pinning on Pinterest. And so I own different cookbooks for different purposes. There are the workhorses like The Flavor Bible or Mark Bittman’s How To Cook Everything that I use for reference almost every day. 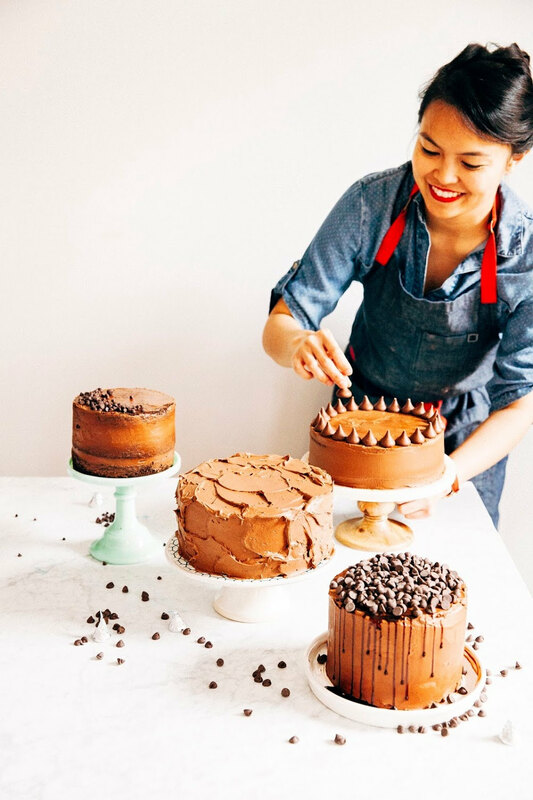 There are the showstoppers filled with stunning photos that I flip through for visual inspiration before I shoot (A Kitchen in France, Small Plates and Sweet Treats or What Katie Ate are all great books for getting inspired). Then, there are the ones filled with crazy recipes with advanced techniques that I can only aspire to — Dominique Ansel’s The Secret Recipes cookbook, for instance, which contains THE recipe for homemade cronuts. Yotam Ottolenghi’s cookbooks fall somewhere in between these three categories. His two that I have — Plenty and Jerusalem — are filled with stunning, inspirational pictures and a mix of recipes that range from achievable to aspirational. But oh boy, the moment I flipped through Jerusalem and spotted his recipe for chocolate krantz cake, I knew I was in trouble. It was the sort of stunning, delicious and yet oh-so-time-consuming recipe that straddled the line between achievable and aspirational. 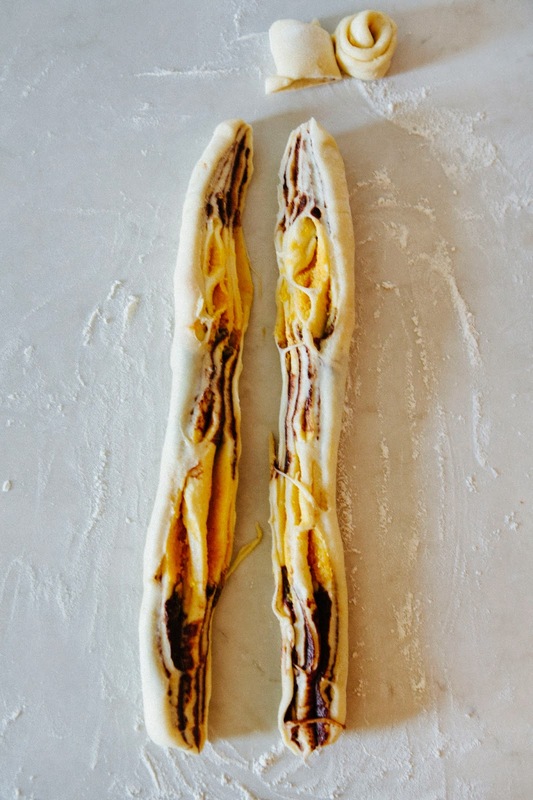 Ottolenghi’s recipe divides the dough in two and braids the two strands together; with this method, my two toppings swirled into each other, creating a sort of marbled effect in the bread. One bite initially yields the dark chocolate flavor, while a second bite yields buttery, cinnamon-tinted pumpkin. 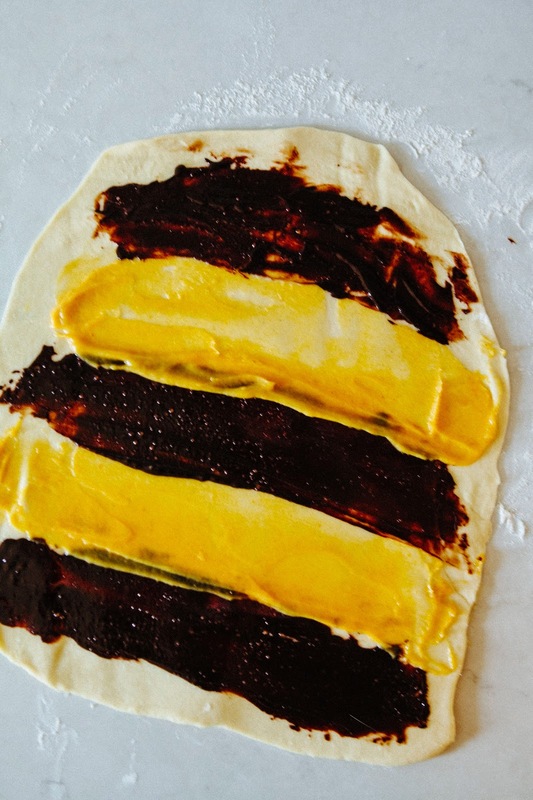 The trick, however, is to get a bite of the two together — because is there really a better flavor combination than chocolate, pumpkin and cinnamon? As for the recipe itself, I was pleasantly surprised to find that the babka wasn’t actually that hard to make. Sure, it takes a while — you’ve got to let the dough rise overnight, then for another few hours after you’ve rolled and braided it — but most of that time was inactive and spent binge-watching Gilmore Girls on Netflix. 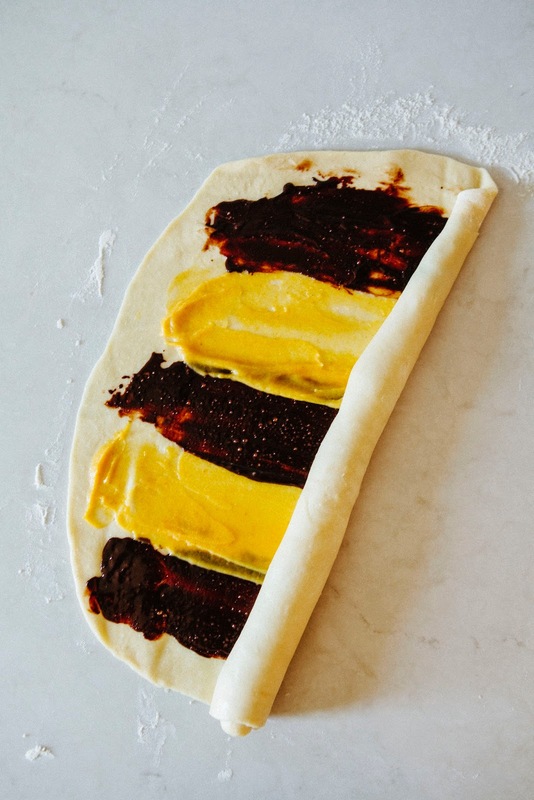 As for rolling it out and braiding it, the dough is incredibly forgiving and easy to work with, more similar to pliant Play-Doh that stays together versus a sticky, fussy pie crust. There are a couple tricky steps in the recipe, so I’ve included process shots with the steps. Plan ahead for this one! The dough requires you to make it ahead of time to allow it to rest and proof overnight. After that, there's another 2 hours or so of waiting around until it rises. You can try and make it in one day by letting it proof for 4 hours or so, but the dough is easier to work with when it's been chilled overnight. It's best to make the dough first, then the two fillings, before rolling out the chilled dough and stuffing it with filling. The original recipe in the cookbook calls for you to combine flour and yeast together with water, not specifying what temperature the water is. I was skeptical since in order for yeast to work, it needs to be "activated" by warm water between 80 to 90 (F). Indeed, I googled other folks who'd tried it, and found that their dough barely rose with cold water unless they were using instant or rapid rise yeast. Since I only had active dry yeast at hand, I decided to use warm water... with great results. This is how I've written it in my recipe instructions, so if you're following my instructions to a tee, it's important to remember that yeast is a living thing — it thrives when the water's not boiling, but just warm enough. A good test is to stick a finger in the water and see if it's a temperature you'd like to take a shower or bath in — if it's too cold or hot for you, it's likely the case for the yeast as well. Don't be worried if, while making this, your braid doesn't look like mine in the process pictures. 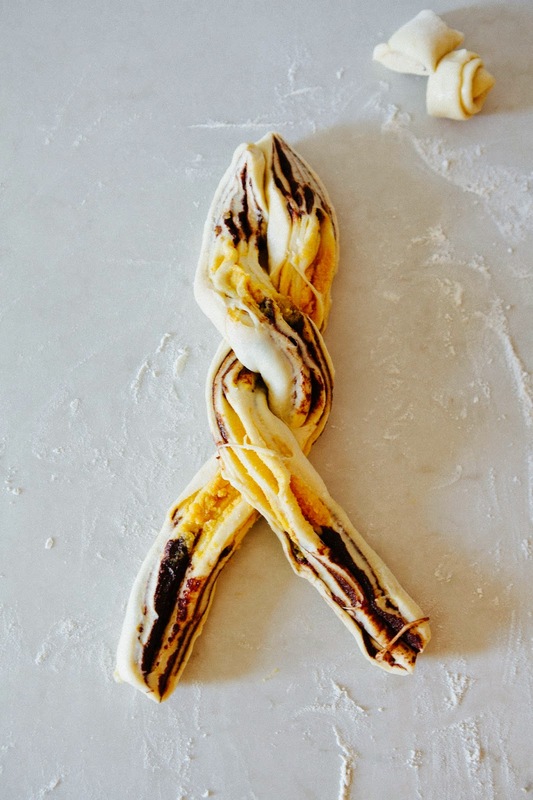 It's really hard to screw this up — the braid bursts open in the baking process, hiding your mistake and making it seem like whatever you did was intentional. You can see from my pictures that my own cuts weren't that clean — there are strands of dough here and there, but it didn't matter in the end. In any case, it'll taste awesome no matter what. In the bowl of a freestanding electric mixer fitted with a dough hook, combine 4 1/4 cups all purpose flour, 1/2 cup granulated sugar and 2 teaspoons active dry yeast. Mix on low speed for 1 minute. Add 3 large eggs and 1/2 cup warm water and continue mixing on low speed for a few seconds, then increase the speed to medium and mix for 3 minutes until the dough comes together. When the dough is starting to come together (it should start to ball up around the dough hook), add 1/4 teaspoon kosher salt. Continue mixing on medium speed and start adding 2/3 cup cubed, unsalted butter, a few cubes at a time, mixing until it is incorporated into the dough. Continue mixing for about 10 minutes on medium speed, until the dough is completely smooth, elastic and shiny. During the mixing, you will need to scrape down the sides of the bowl a few times to make sure the entirety of the dough is kneaded. After around 10 minutes, the dough should start pulling away from the sides of the bowl. Coat a large bowl evenly with sunflower oil, and transfer the dough to the greased bowl. Cover with plastic wrap, and leave in the fridge for at least 6 hours, preferably overnight. In a double boiler (or a heatproof bowl on top of a saucepan filled with water, making sure the bowl doesn't touch the water) over medium heat, combine 2.25 ounces coarsely chopped dark chocolate and 1/4 cup unsalted butter. Melt, stirring occasionally to fully combine the two together. Once both the butter and chocolate is fully melted, remove from heat and allow to cool slightly on a wire rack for 10 minutes. Once the chocolate has cooled slightly, whisk in 1/4 cup confectioner's sugar and 5 tablespoons plus 1 teaspoon natural cocoa powder into the melted chocolate and butter. Set aside to cool slightly as you make the pumpkin filling. As it cools, you will get a spreadable paste. In the bowl of a freestanding electric mixer fitted with a paddle attachment, combine 1/2 cup (1 stick) unsalted butter, 1/4 cup confectioner's sugar, 3 tablespoons pure pumpkin puree, 1 1/2 tablespoons maple syrup, 1 teaspoon ground cinnamon and 1/2 teaspoon kosher salt. Beat on medium-high speed until a pale and fluffy orange paste. Prepare two 9 by 5-inch loaf pans by spraying generously with cooking spray and lining the bottom of each pan with parchment paper. Spray the parchment paper and sprinkle each pan with a light dusting of flour, tapping out any excess flour over the sink. Set aside. Divide the refrigerated dough in half and keep one half covered in plastic wrap in the fridge. Roll out one half of the dough on a lightly flour surface into a rectangle approximately measuring 15 by 10 inches. Gently squeeze together the ends. Cover the pan with a wet flour cloth (but not terrycloth!) and leave to rise in a warm place for 1 to 1 1/2 hours. The cake will rise by 10 to 20 percent. Repeat the whole process to make the second cake. Preheat the oven to 375 (F), making sure you allow plenty of time for the oven to preheat fully before the cakes have finished rising — I would turn the oven on 45 minutes into the babkas' rising. 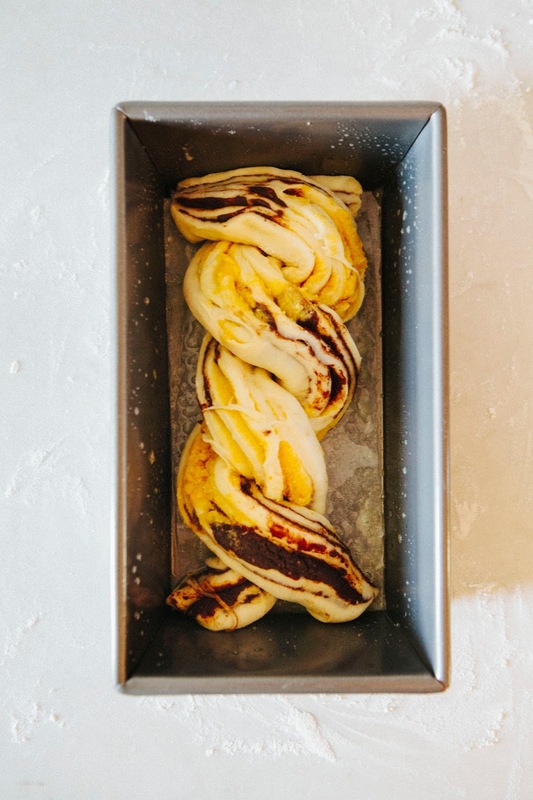 Once the oven is preheated and the babkas have risen by about 10 to 20 percent, remove the flour cloths and bake the babkas on the middle rack of the oven for about 30 minutes, until a skewer inserted into the center comes out clean. 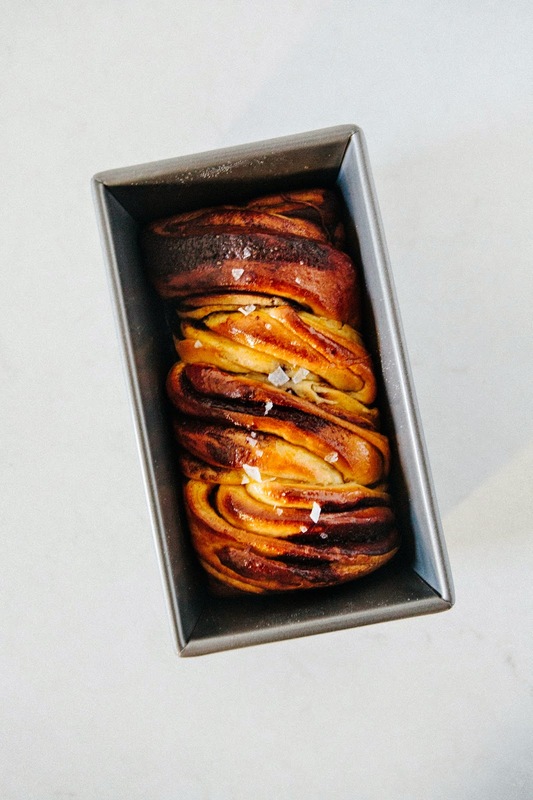 A skewer inserted into an underbaked babka will feel /rubbery inside and may come back with dough on it. When fully baked, you’ll feel almost no resistance. 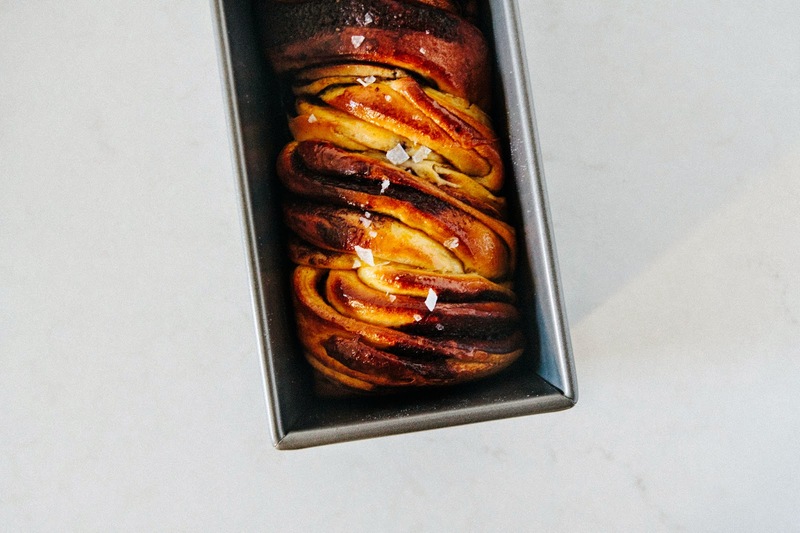 If you babka needs more time, put it back in the oven for 5 minutes at a time before re-testing. If it browns too quickly, you can cover it with foil. When the babkas are in the oven, make the syrup. Combine 1/3 cup water, 6 tablespoons granulated sugar and 1 teaspoon ground cinnamon in a small saucepan over medium heat, bringing the mixture to a boil. As soon as the sugar dissolves, remove from heat and allow to cool slightly. When the babkas come out of the oven, brush the syrup immediately over the babkas. It will seem like too much syrup, but it's important to use all of it — the babkas aren't very sweet without the syrup. Sprinkle immediately with flaky sea salt. Allow the cakes to cool on a wire rack until they are just warm, before turning out from the pan and serving. Oooh, yes! I saw yours and it looked absolutely lovely. Great minds think a like! im not a cookbook collector but i love when i visit libraries and flip those cookbooks. 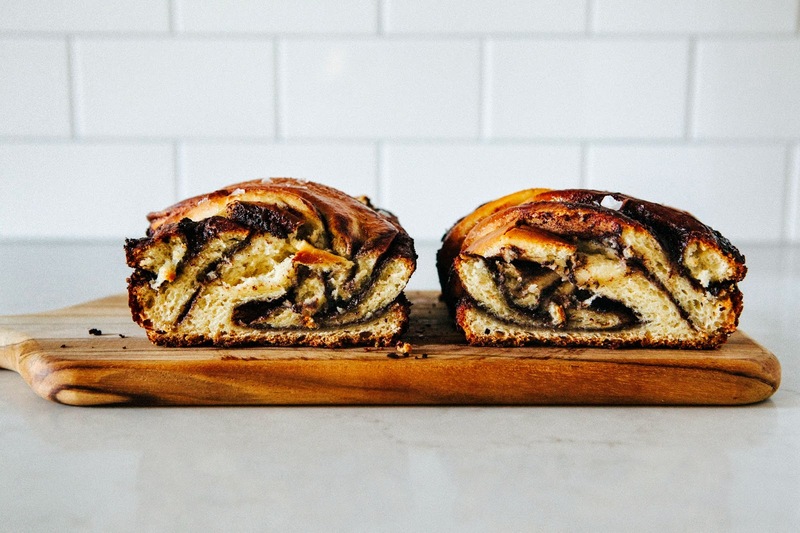 nothing can really beat that feeling..this babka looks amazing and the flavors are just, i cant even. pinning it immediately. 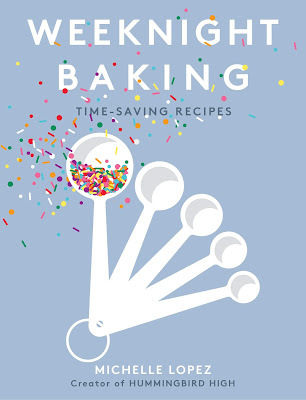 Library cookbooks are also the best — you can explore so much more and not have too spend any of your own money! Yay for public libraries!!! wow this bread looks ABSOLUTELY delectable! Wooooowwww this looks and sounds amazing! I totally agree with you about cookbooks - it's just not the same as looking at a recipe online, and they're infinitely inspirational. Also - YAY for binge-watching Gilmore Girls!!! Totally did that this weekend with The Husband to finish up his first time through and it was awesome. That show kept me company for many hours in college while I was working on homework. Lovely work, as always! Oh wow, did you guys already finish all the seasons? I'm still at the part where Rory's in her first year at Yale. But yay for Gilmore Girls! I'm convinced that Rory and I would be BFFs in real life. Yum! This looks really tasty... and beautiful! i have only recently started to collect cookbooks, and yes, there is something enigmatic in flipping through the pages. have you been thinking about writing your owm cookbook? Hhahah, writing my own cookbook? It's come up a couple of times through the years, but I just don't have the time right now! Maybe one day, some day. OMG, too bad we don't live in the same city, because I would totally unload all my extra cookbooks on you. We could do a cookbook swap! Bloody hell, this is a total stunner. Plus I think the flavour combo that you used must just make it over the top delicious. I've had this recipe bookmarked but always been a bit scared (I can't braid my own hair, let alone a loaf of bread) but you've made it look easy! You can do it, Kathryn, I know you can! You're such a talented baker. Heck, I can see you making a gluten-free variation, which would be an incredible feat. 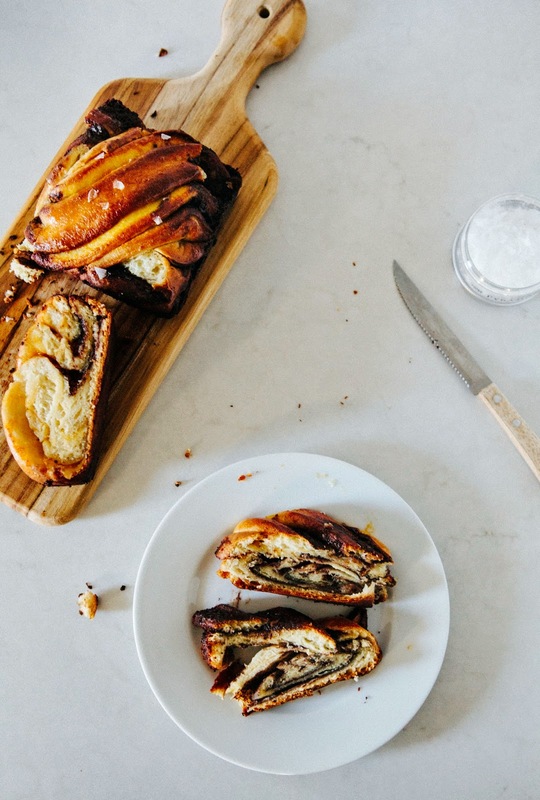 Oh how I love a good babka. This is gorgeous! Hahha, exactly. Couldn't have described it better myself! I knew someone would do this, so how come I'm not surprised that it's you? It's that time of year to start baking and I have loved this recipe for awhile. Guess, I'll have to give this one a try, too! I ACTUALLY TASTED THIS ONE! hahaha First time ever. Thanks again for bringing it! I loved it. Hahah yes! Sorry it was a bit stale when I brought it over. Next time you'll get the supa fresh ones. This looks so yummy. I'm going to add to the must bake list. And thanks for the list of cookbooks I need to check out. I love baking cookbooks the most. Yeah, the magic of cookbooks. I'm a crazy cookbook collector myself and you should see my Amazon wish list... Ottolenghi's books are genius (you should get Plenty More!) and belong to my favorites. I love to get inspired by his recipes; he has such a special take on ingredients. The babka recipe in Jerusalem was one I instantly fell in love with (although, haven't made yet). 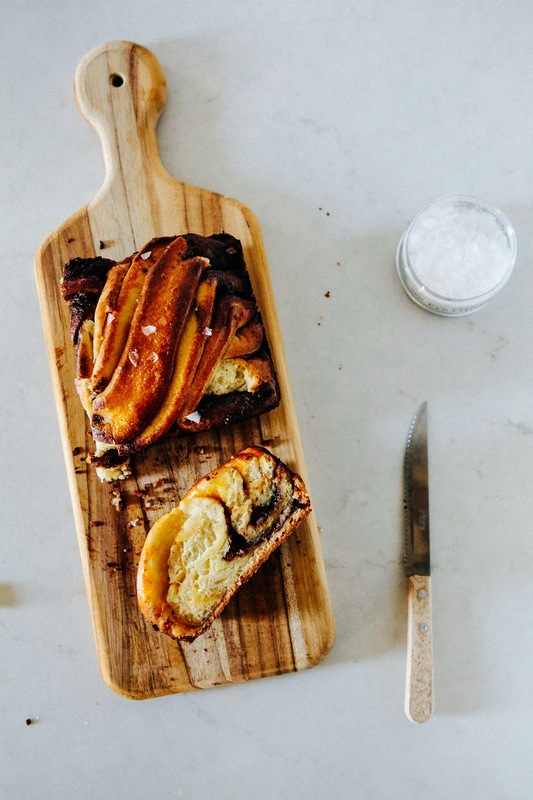 Your chocolate pumpkin babka looks fabulous! I am cookbook maniac as well. You are right, there is something about flipping through the pages of cookbooks. I find it very inspiring. Ottolenghi's new book Plenty More is amazing as well. I just got my copy. The creativeness that comes from his kitchen (and mind) is mind blowing. 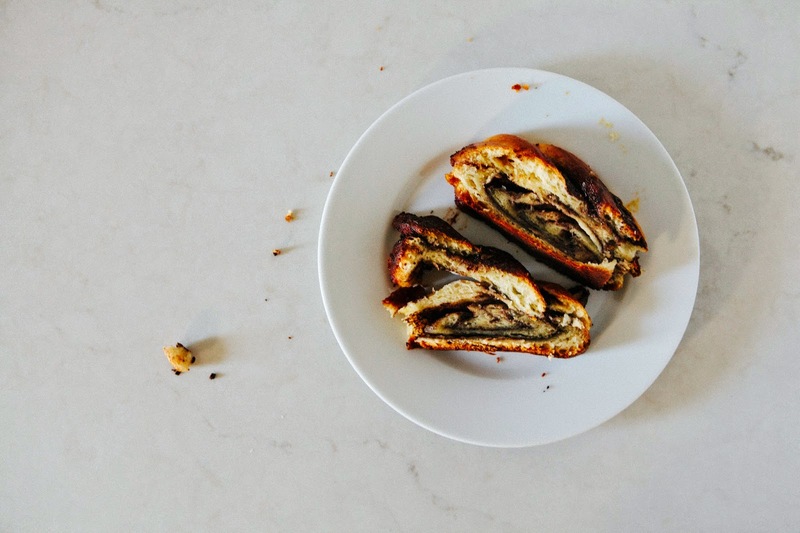 I have made this babka several times and your notes are so well written and true. And your version with pumpkin and chocolate looks and sounds delicious.